My name is Alex Bradford but in the cosplay community, I’m known as Alaska. The reason for choosing that for my cosplay name is because I moved her from Alaska. When I got to know people, I just told them to call me Alaska because I thought it was a cool nickname. I was born in Texas but moved to Alaska when I was 7. Then I moved to Lafayette, Louisiana after my 7th grade year. I love reading and drawing and hanging with friends. I currently go to school at the University of Louisiana at Lafayette. I’m a senior in the college of Education. I am really easy to talk to and I make friends easily. My first convention was MechaCon VI in 2010 but I didn’t start cosplaying till the following year. My friend called me and was like “you should go to this convention with me.” I’d never heard of conventions or cosplaying so I said yes just to see what it was. I arrived at MechaCon and fell in love. I mean, I don’t think you can find anywhere else that has crazy people that dress up as their favorite characters and take over a hotel except at a con. I didn’t get to cosplay that year but the following year I was determined to join in on all the fun. 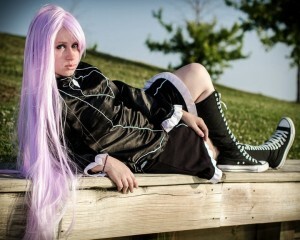 My first cosplay that I made was Felli Loss from Chrome Shelled Regios. That was the first anime that I watched and actually loved a character. Felli was just like I was, quiet but really powerful when she wanted to be. I chose her school outfit because it was easy and I could learn to sew buy making it. That was also the first prop that I ever made. I don’t really have a favorite cosplay that I’ve made. Even though I haven’t made that many, I can’t really decide on what cosplay is my favorite. They all have their awesome parts and parts that I wish I could have done differently. If I really had to choose which cosplay I liked the most, I would have to say Seto from Needless. She’s really crazy and she carries around this huge sword. I just watch a bunch of anime and then if a character pops out at me, I go research the heck out of it. How I really determine the character though, are the props. I absolutely love really big and extensive props. That’s really what I’m known for. Before cosplaying, I didn’t really talk to other people. I mean, I did when I had too, but other than that I kept to myself. I didn’t really hang out with people nor do crazy things. Now I can meet new people and talk to them like we are old friends. 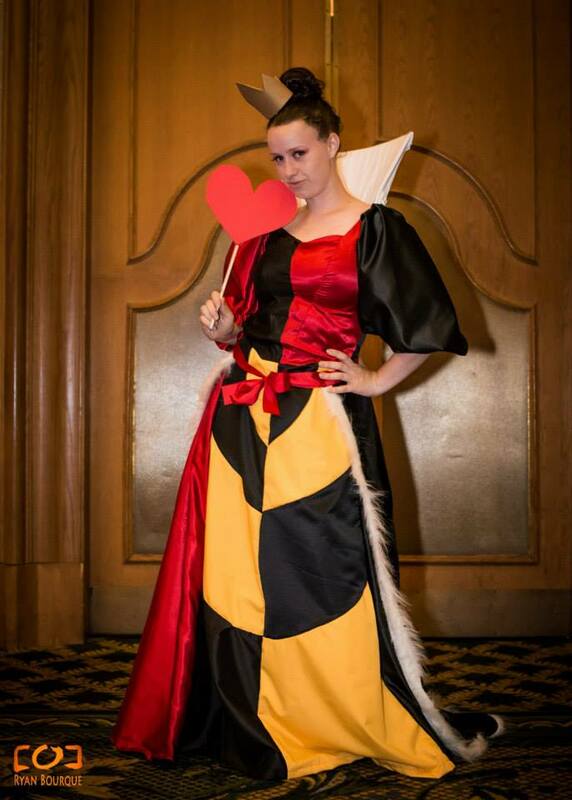 It has allowed me to go to other states and participate in events that I would never been able to do without cosplay. I can actually get up on stage and perform and I don’t really freak out. I also have way more friends now than when I wasn’t cosplaying. It allows me to talk to a stranger about something we have in common. I really want to cosplay White Rock Shooter. Other than that I don’t really have a dream cosplay. I just put a lot of ideas in a folder on Facebook and then eventually I will get to them. 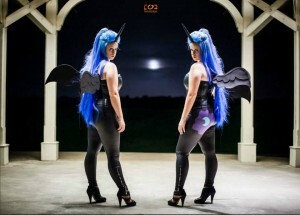 I would have to say I have 3 different cosplays that were hard to fabricate. Each cosplay was hard for different reasons. Seto’s sword took 8 months to make because I’d never built anything before and I was using hard materials to make the base of the sword. Eucliwood Hellscythe was hard for several different reasons. One was the prop and breastplate which were both made out of fiberglass. I also created a chainsaw out of cardboard and fiberglass for my cosplay partner at the same time. The other reason this cosplay was hard to fabricate was because of all the hand painted pin striping. It took 14 or more hours to draw all the lines and then go back over the lines with paint. 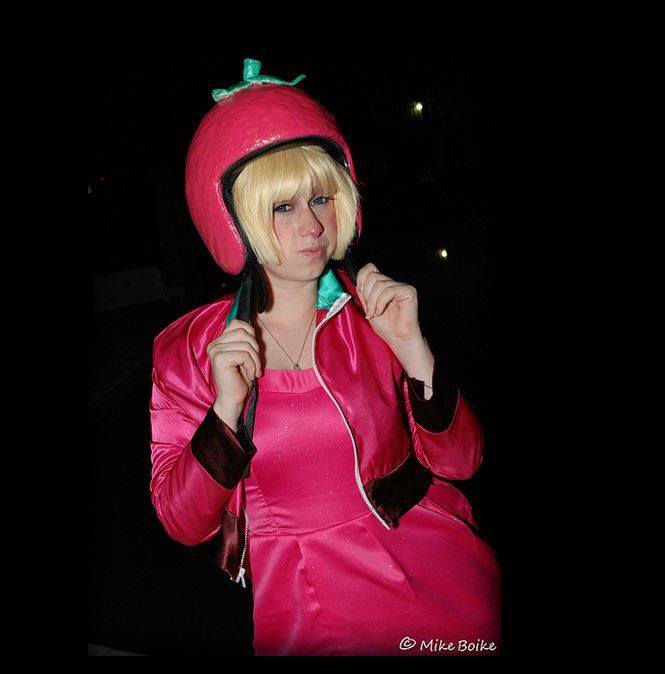 The next cosplay that was really hard to make was Priscilla. 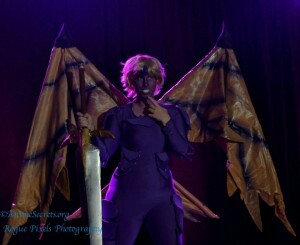 I had to make both a working set of wings, and a sword that would withstand hits during a skit. Fabricating the wings took several weeks of planning, building, and painting. Due to the rushed nature of the fabrication of this particular cosplay, things weren’t made to the best of my ability and I really wish that I would have made them differently. I’m currently working on Galadriel from Lord of the Rings, Maganium (Pokemon gijinka), revised Priscilla from Claymore (for WCS US finals) and a secret cosplay that I will be debuting at Anime Matsuri 2014. I can’t wait to wear my LOL cosplay. I haven’t told anyone what it is yet but when I make it, it’ll be awesome. It’s a combination of an awesome prop and great armor. Honestly at this point, I don’t think that I will retire anytime soon. 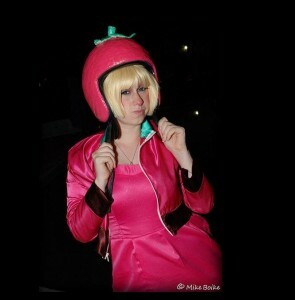 Actually I have but I don’t think that I’d ever actually wear some of my crazier cosplays. I have only bought part of one cosplay. I always try to make/fabricate every part of my cosplays. I get more satisfaction that way. I have nothing against those who buy their cosplays though. I just don’t have as much fun if I don’t make what I wear. Honestly they don’t really. I mean I try to make my cosplays a little more modest, but that’s because I don’t think that cosplaying should be all about how much skin you can show off. I haven’t really done a cosplay that requires me to drastically change something. I try to keep the designs of the cosplay the same as the character. Although there have been times when I have to change a small design because of modesty, I have stayed true to the character. I love the attention but I don’t let it go to my head. I like when other people enjoy something that I have created. It makes me happy especially when people message me with questions about how I made parts of my cosplay. I was asked to cosplay a character that showed off a lot of skin and although I’m not extremely big, I felt like people would talk about my body image because I wasn’t suited for the cosplay. After I did a photo shoot with my photographer and we posted the pictures, there was so many positive things that people said. It made me feel a lot better about the cosplay. I still don’t like wearing it, but I will wear it out in public and not feel overly uncomfortable. One of my favorite moments was during MechaCon VII. I was cosplaying Seto and everyone absolutely loved my sword. They would ask to pick it up and when they did, they couldn’t believe that I was carrying it around because of how big and heavy it was. Another moment that was my favorite while cosplaying was placing 3rd at San Japan 2013’s qualifier for WCS. I’ve never received anything from a contest before this year and it was really cool to see all our hard work actually pay off. I try to compete in the contest for every convention that I go to. I’ve also competed in a qualifier for the WCS 2014 circuit. I haven’t really participated in online contests because I’m usually judging them. Taffyta Muttonfudge from Wreck it Ralph. I’ve won a judges’ award at LouisiANIME 2013 for Taffyta Muttonfudge alongside Awkward Cosplay Girl who was my partner for the contest. I also competed in one of the WCS 2014 qualifiers this past August and place 3rd along with my partner Kitty. We are currently gearing up for WCS US Finals so we will see how that pans out. I personally like handmade cosplays but I have nothing against store-bought. I like making my cosplays because then I feel like I really am cosplaying and not just modeling what someone else wore. I try to get into character a lot. 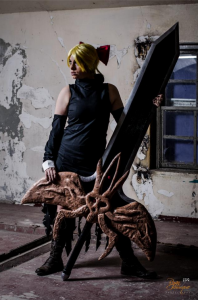 I cosplayed Eucliwood Hellscythe who doesn’t speak and for the entire time that I wore her, I carried around a little notebook and never spoke. It was really fun especially for those that knew who I was cosplaying and loved that I stayed in character. I love when people get into character because it helps with the cosplay. It shows that they know the character and they’re not just cosplaying because they like the outfit or something along those lines. I really with that I could meet Kamui Cosplay. Her cosplays are absolutely amazing. She is one of the reasons why I really love cosplaying. 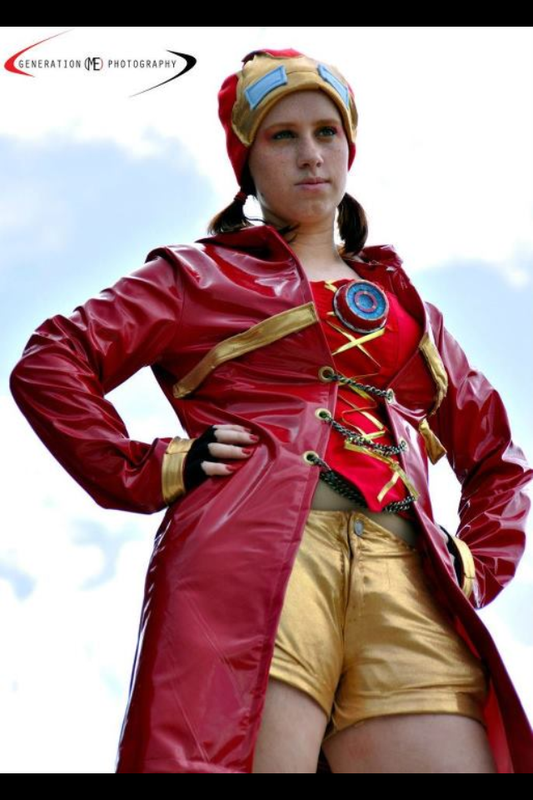 She can fabricate an entire armored cosplay in no time at all as it looks perfect. I love positive and negative feedback because it gives me the opportunity to take the comments and use those to better my next cosplay. I don’t fret with the negative. It’s just someone else’s opinion and it honestly doesn’t really matter to me. I’m not cosplaying for other people. I’m doing it because it’s what I love to do. Don’t let other people intimidate you just because you think that their cosplay is better than yours. They might be envious of you. Do your best and have fun. You don’t know what you are capable of until you try so never give up no matter what. I like drawing and reading. I also sing on occasion. I have two dogs. Sam is a long-haired Chihuahua and Sassy is also a Chihuahua but we don’t know what type. Not really. I mean the only thing that I do is either go to school or work. I hang out with my friends on occasion but other than that I really don’t do anything else that would give me ideas. 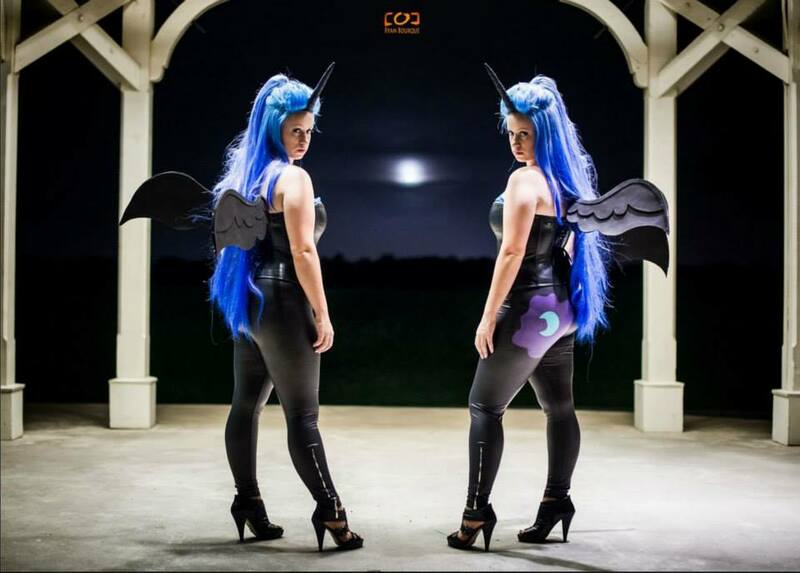 There is nothing better than putting on your cosplay and strutting around. It makes you feel powerful and it’s really fun doing it. Go out into the world and show everyone that we are a force to be reckoned with. Love what you do and have as much fun doing it. Don’t let others tell you that you’re not worth it and that your cosplays aren’t great because they’re just jealous they couldn’t do it as good as you. You’re all awesome and thank you for taking the time to read about little ol’ me.